When testing samples, the USDA personnel wash or peel produce to mimic consumer practices. A single sample of strawberries showed 20 pesticides, the report indicated. More than 98% of strawberries, spinach, peaches, nectarines, cherries and apples tested positive for at least one pesticide residue. And, on average, spinach samples had 1.8 times as much pesticide residue by weight than any other crop. Spinach is the second dirtiest item on the “Dirty Dozen” list, followed by (in order of contamination) nectarines, apples, grapes, peaches, cherries, pears, tomatoes, celery, potatoes and sweet bell peppers. Each of these foods tested positive for pesticide residues and contained higher concentrations of pesticides than other produce. Should We Be Worried About Conventional Produce? For a start, this is information from the US. The practices there are different from Europe and they allow substances to be used which are not allowed in Europe. Why are we focused on the pesticides in fruit and vegetables only? Why are we not coming out with a list of the most contaminated fish, chicken, eggs, milk or meat? You see, the highest concentrations of pesticides occur higher up in the food chain. Because cattle are eating food that has been treated with pesticide. Then that pesticide gathers in the tissue of the animal. It becomes super concentrated. But you don’t hear people worrying about the pesticides in the meat they eat? Vegetarian women were found to have lower levels of pesticides in their breast milk than the average meat-eating woman. I had a friend one time who I offered some Strawberries to. He asked if they were organic and seemed very hesitant to eat them if they were not. In my mind, I wondered if he ever asked the Indian takeaway that he frequented whether all of their food was organic. Or the processed microwave meals he ate, or the 2 litre bottle of Pepsi. Why exactly is this? Probably because people are not addicted to fruit. They are not desperate to eat it, but really they should be. Personally, I don’t worry about the pesticides in fruit. That may be controversial, but I just don’t see people suffering from pesticide-related issues. Pesticides are not making people fat, giving them heart disease or diabetes. Also, the benefits of eating fruit may outweigh any risk of pesticides. Partly, that is because plant foods, in general, have the least concentration of pesticides. But also may be to do with phytonutrients in plant foods having a mitigating effect on the toxic effect of pesticides. Is Fruit Bad For People Who Have Cancer? 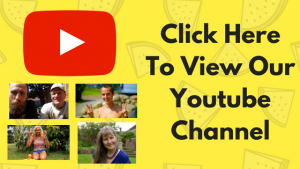 In this video, various leaders in the health movement are asked their opinion on fruit. The first 4 speakers appear to be fairly anti-fruit. Then Dr Garth Davis takes the microphone. Thankfully, despite not being a fruitarian or raw vegan, he comes out in defence of fruit. 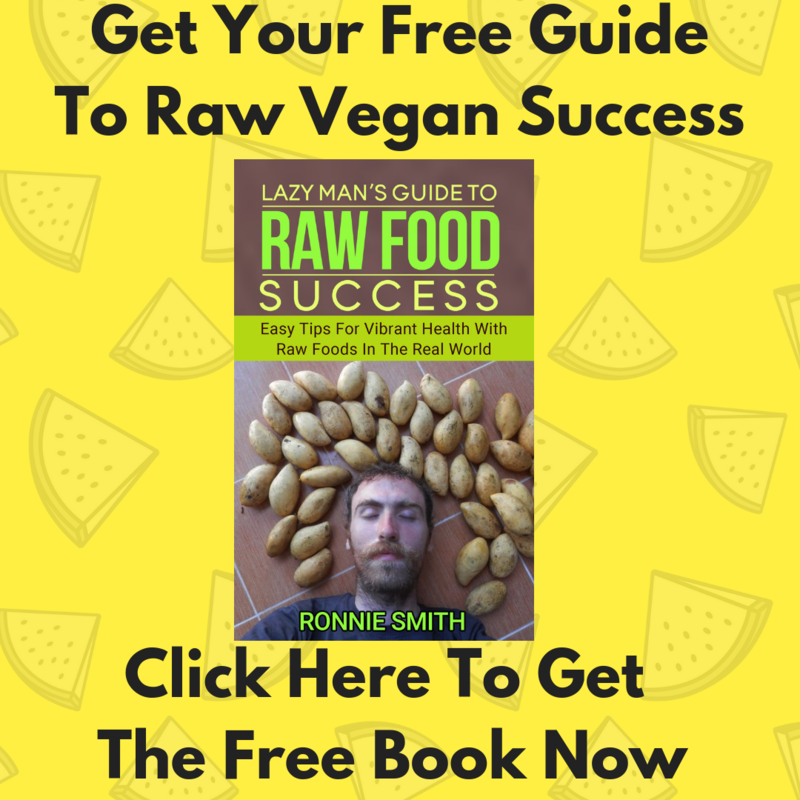 He also references some well known names in the fruitarian raw vegan movement such as Kristina Carillo-Bucaram and Michael Arnstein and testifies to how healthy they are. Dr Davis mentions how fruit is probably the best substance for us to be eating. It turns into a bit of a debate between him and Brian Clement about the effect of fruit on cancer. It’s worth a watch and a share. 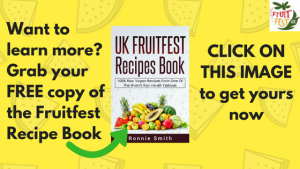 Why Is Everyone Talking About The UK Fruitfest? This film is a compilation of different clips we have taken over the years. It includes footage of the activities from the festival and interviews with our speakers and our attendees. …..and lots of contributions from many of our amazing previous attendees. Of course, feel free to share with everyone and anyone! You may have seen a lot of information telling you to reduce the amount of carbohydrates you eat. You may have come across “low-carb” diets in which the aim is to eat very little carbohydrates or NO carbohydrates at all. Why Is This A Misguided Idea? The Human Body’s preferred source of calories is from carbohydrates. The longest living and healthiest cultures, studied in the Blue Zones study, universally lived on diets in which carbohydrates made up at least 70% of the calories. To be optimally healthy we must eat enough carbohydrates every day. If we don’t then inevitably we will turn to consuming fat to make up the difference. The more fat we eat the less efficient our body becomes at uptaking, transporting and utilising oxygen and blood sugar. This has a negative impact on our health, our mood and our performance. Check out the video with Dr Graham to find out more. A Tesco worker came up with an idea to give away free fruit and it’s been hailed as a national success. “Tesco’s ground-breaking Free Fruit for Kids initiative has proved a real hit with children and parents, with over 50 million pieces of free fruit given to children since the programme launched almost two years ago. The scheme was the brainchild of Maria Simpson, a customer assistant at Brigg Superstore, who suggested giving free fruit to parents for their children to eat during shopping trips as an alternative to sweets. The idea was taken up by the Brigg store and was so well received by customers that Tesco decided to launch it nationwide, with stands now in 800 stores across the UK. Does A Raw Vegan Diet Lead To Weak Bones? From an early age, most of us have been told that we need calcium for strong bones. We get told that to get that calcium we must drink milk. Well, certainly, calcium is a part of our bones but is milk the only place we can get enough of that? No other animal on the planet drinks milk beyond it’s childhood, and NONE are drinking the milk of another species. Yet they all have strong bones. We get calcium (and the other components required for healthy bones) in fruits and vegetables, in the same way that a cow gets enough calcium from eating grass. However, there has been a myth that vegans and in particular raw vegans have weak bones that fracture more easily. If that was the case, I would really know about it. I’ve been practising martial arts for about 10 years, and 6 as a raw vegan. Having been thrown around and landing on my back, my arms or legs hundreds of times surely if my bones were weak I would have had a fracture by now? I’ve had conversations with raw vegans who fell off of bikes or were involved in some other accident and couldn’t believe they DIDN’T break a bone. “Those on the raw food diet had lower body mass indices and lower bone mass in important skeletal regions such as the hip and lumbar spine, sites where low bone mass often means osteoporosis and fracture risk. But they didn’t have other biological markers that typically accompany osteoporosis and fracture risk. It seems to suggest that we don’t need to worry about having lower bone mass as our bones are strong and not prone to fracture or osteoporosis. As for osteoporosis, isn’t it funny that osteoporosis occurs far more in the countries that drink the most milk? Are You Like Joni Mitchell? Sorry Joni, It seems, in general, most people don’t want spots on their apples. For fruit to sell in the supermarkets it has to look immaculate, no blemishes whatsoever and perfectly shaped. Which you might think strange, as really it should be the taste that is most important. But it’s perfectly natural for us to find the fruit with the least marks, bruises or blemishes as that could be a sign of alien invaders eating into the fruit. We are very fastidious when it come to our food. People check their food to make sure their are no little surprises lurking within and many people are obsessed with cleaning their food and their utensils. This has led to millions of tonnes of fruit being thrown away because it is not the right shape, size or colour. This despite the fact that in some parts of the world people live in malnutrition and poverty. Morrisons have just come out to say they will be selling more “wonky” i.e misshapen fruit. Is this a sign that people are finally accepting that fruit doesn’t have to look perfect to taste great? If it is, then this is a good thing. Less fruit will be thrown away and there will be more of an emphasis on taste rather than appearance. Substance OVER style if you will. At Fruitfest we always strive to select food based on what tastes best. That is generally, the fruit which is most in season at that time, hitting peak ripeness and flavour. Historically, we have not been able to source a 100% organic source of fruit for the festival. As far as I am aware (correct me if I am wrong) there is no 100% organic wholesaler of fruits and vegetables in the UK. The closest one I believe is either in Paris or the Netherlands. Having tried to order organic fruit from Paris in the past I wasn’t impressed by the service, or the inconsistency in what I ordered versus what actually turned up. If you want more organic fruit to be available, or more wonky fruit, you must choose to vote with your wallet and choose organic. For me, I must honestly say, I rarely look for the organic sign anymore. I just look for what looks like it tastes the best. Maybe that is something I need to work on, but from a health perspective, I know that the benefits of eating raw fruits and vegetables far outweigh the unknown risks of trace amounts of pesticide on our food. Many people hold fruits and vegetables to a higher standard than other foods. I doubt he asked if the 2 litre bottle of Pepsi he regularly drank was made from all organic ingredients. Or when he gorged on Indian curries at his local takeaway, I never heard him ask if the food was organic then. The truth is that the foods with the highest concentration are those higher up in the food chain….i.e. animal flesh. The toxins that the cow takes in from eating corn or soya beans that have been treated with pesticides become concentrated in their flesh. If pesticides are causing health issues, it is more likely to happen to meat eaters than fruitarians. Enjoy your fruit without fear! As for organic fruits and vegetables, I had a look into this as someone said to me “organic fruit gets sprayed EVEN MORE than conventional”. Some of these myths get bandied about too. In the UK, a limited list of substances are allowed to be used as pesticides (you can check the list out at the Soil Association site). Most of these are “natural” pesticides. For example clove oil can be used as a pesticide. Whether that is better for our health I don’t quite know but it is better for the environment it would seem. Parking lots, roads, buildings, cities take up a very small space on our planet. In reality we have cut down the forests, drained the swamps and dug up the plants to make way for pasture land for cattle or to plan the foods that we feed to the cattle. By changing the world to vegan and eventually fruitarian we can recreate paradise. We can plant the trees again and live in more harmony with nature. Fruit is the most efficient yielding crop, we can reduce the amount of land we require hugely by eating more fruit. 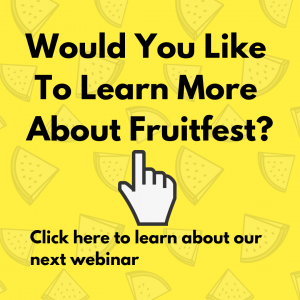 We’ve got a long way to go, but if you want to be part of the movement come along to Fruitfest 2018. 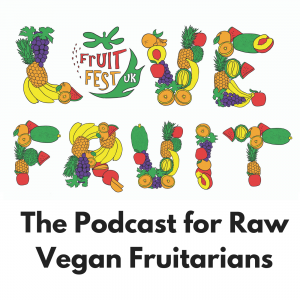 In this video, one of our previous attendees, Michelle, shares her experience of the UK Fruitfest. This is quite a funny story from the Telegraph the other day. “Parents have been taking advantage of the fact Easter Sunday has fallen on the same date as April Fools Day by coming up with imaginative ways to get their children to eat fruit instead of chocolate. For the first time since 1956, the two dates have coincided to allow mums and dads to get creative. Did you do this with your kids? Hopefully, yours don’t need to be tricked to eat fruit! DIABETES type 2 symptoms include feeling thirsty all the time and losing weight without trying to. Keeping active is a good way of preventing the condition and keeping blood sugar levels normal, alongside a healthy diet. Some foods should be avoided however, including a certain type of fruit. “Unfortunately, its sugar content becomes more concentrated as well. “One cup of grapes contains 27 grams of carbs, including 1 gram of fibre. By contrast, one cup of raisins contains 115 grams of carbs, 5 of which come from fibre. What they fail to do is connect dried fruit as being a problem with diabetes. Have you met anyone who became diabetic because of eating high quantities of dried fruit? This is another mistaken article carrying on the incorrect idea that sugary fruits or dried fruit can lead to diabetes. In reality, eating more fruit, even dried fruit is good for type 2 diabetics. Because the problem with Type 2 Diabetes is a build up of fat in the muscle tissue and bloodstream. This is preventing the body from properly digesting, assimilating and utilising the sugars in our diet. This information has been known for a long time but in the mind of the public the idea is still set that sugar causes diabetes. Unfortunately, a lack of nutrition training within the medical industry is allowing medical professionals to give all sorts of unsual information out seemingly with no scientific basis to what they saying. My dentist told me that if you eat 7 bananas you can die of potassium poisoning. This is completely incorrect. Trust me, I’ve done the experiment on a daily basis for at least 5 years. Also, recently, a lady gave me her juicer. She told me that she didn’t realise you could get sick from drinking too much vegetable juice. I asked her where she had heard that. She said she had not been feeling well and went to her doctor. The doctor told her that it was the juicing that was making her ill.
Are vegetables making people ill? Last time I checked it was the opposite. There is so much misinformation out there you have to stay vigilant. Check the sources of information and feel free to ask your doctor or anyone else to verify exactly what evidence they have to back up their statement. Take action whenever you see this happening. Contact companies or press organisations making statements and ask them to show you the evidence. Get in touch with your local political representative.